Heat oven to 375°F. Line large bakingcookie sheet with cooking parchment paper. Unroll dough; separate into 8 triangles. Place 2 candies on shortest side of each triangle, and roll dough into ball to within 4 1/2 inches from opposite point; pinch openings to completely enclose candies. Turn over; place on bakingcookie sheet. Using pizza cutter or sharp knife, cut unrolled portion of dough to make two ears, starting at point of triangle and cutting toward rolled portion. Using finger, press indentation into bottom half of each ear; fold tops of ears down. Add small amount of nonpareils to indented portion of dough, and press heart onto stuffed dough portion for nose. Bake 11 to 14 minutes or until golden brown. Cool 2 minutes; sprinkle with icingpowdered sugar. Serve warm. Dough should not be stretched too thin when rolling dough around candies, and openings should be completely sealed around candies before baking. A great way to use up extra chocolate Easter candy is to substitute the candies with unwrapped chocolate eggs or even a tablespoon of chocolate chips. The chocolate eggs with candy shells do not work as well in this recipe. 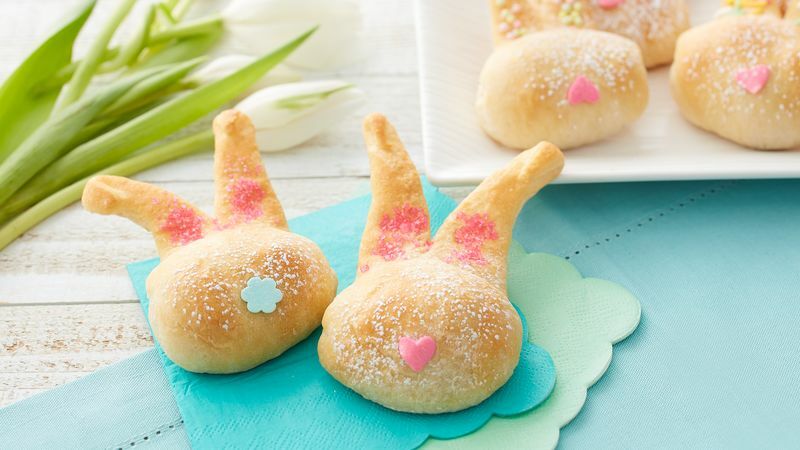 Have fun with the kids and have them help “decorate” their bunnies before baking.